The minimalist design comes to life in this house, mainly characterized by the simple. This is how the straight lines and good finishes are the privileged ones, as well as wide and well-lit spaces. As seen in the photographs the walls have a perfect polished concrete. 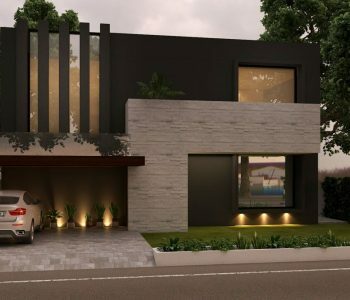 Its minimalist façade stands out with nature and has two floors, garage for two big-sized cars, two living rooms, drawing room, two kitchens, five bedrooms with attached washrooms, a store room, servant quarter with washroom, terrace and a beautiful landscaped front garden. The rectangular volume is present and helps to define the lighting from the windows. The prominent feature of the minimalistic style is the flat terrace extruded from the building. The flat surface walls painted in charcoal grey, and the overall shape reflecting the modern straight lines. Another aspect to consider is the vertical rectangular windows on the first floor. The location of the garden is appropriate to take advantage of all the shape. The rooms are spacious and illuminated, thanks to the windows that are located both on the ground and first floor of the building, which allow the daylight to enter into the building without any problem and lighting up the rooms, providing the maximum utilization of the daylight. When placing the vertical rectangular windows on the first floor, it was thought that the spaces are not much visible for the outside trespassers, but that they maintain adequate lighting required by the building’s minimalist dwelling. 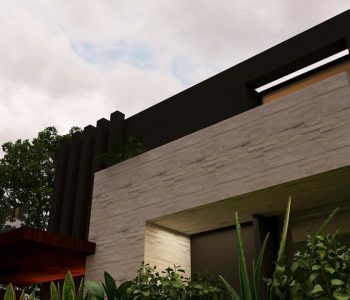 Referring to the constructive details, the defined and open work designs correspond to generate dimension in the house. As we said at the beginning the polished concrete is combined with full charcoal grey paint, while we also find a horizontal block giving a completely modern and updated look to the construction.